Happy Wednesday everyone! Peggy here with you today to share a great little stamp set, Space Boy, just perfect for your little space adventurer on his birthday! There is still lots of time to play along with this week’s YNS Challenge, so charming, for your chance to win a couple of great prizes! I hope everyone has a great day today and thanks for stopping by! Good Morning Everyone, Happy Tuesday!!! Crystal here and I would like to share a creation with you that I made with this FUN new set A Good Friend. I just LOVE this set and it is soooo perfect for those girlfriends :))) Hope you enjoy my creation today!!! Isn’t this bag so fun?? I added stickles to the tissue paper so it would pop, I love sparkle!!! This fun set comes with 6 stamps and 2 sentiments. Check this set out HERE for more details!!! My creation today also fits into this weeks challenge So Charming to add a charm to your card or project!! Stop by and check it out HERE for a chance to win a super fun prize!!!! Thanks so much for stopping by today, I hope everyone has a GREAT Tuesday!!! Today I’ve got a new weekly special up for grabs and it’s a combo deal this week! Fairy Fhiona and Flying High Fhiona – both for $9.95 – WOW! I’d like to say special thanks to DT member Chris Olsen, she has inspired us for many months now with her fabulous YNS projects and although her DT term has come to an end I’m sure we still see lots of YNS creations on her blog – thank you Chris for all your inspiration and for your wonderful friendship. We all wish you the best! It’s a beautiful sunny day here! YAY! It rained all week so I can’t wait to get outside and enjoy the day! Today I would like to welcome back Cindy Haffner to YNS as our May guest designer – welcome Cindy!!! Ainsley from Scotland is so ADORABLE and I love the colors Cindy used and the fun layout! I notied that Cindy used a charm on her card too! ‘So Charming’ just happens to be our current YNS Challenge theme – be sure to check out all the details and join in the fun over at the YNS Challenge Blog. I hope you have a bright and sunny day! I’ll be back tomorrow with a special sponsor announcement! It’s Diana here with a special fishy something lol. I wanted to share a card I created using Fhiona’s Pet Fish. There are several other Fhiona Pet Stamps as well: Fhiona’s Pet Bunny, Fhiona’s Pet Bird, Fhiona’s Pet Turtle, and Fhiona’s Pet Dog. They can all be found at the YNS Store. I think this line is so brilliant. I used the older MOJO173 Sketch for this. I colored the image with my Copics and added the perfect coordinating buttons, as well as some dimension. I topped it all off with my new Nestabilities – Netted Fish. They worked out perfectly with this stamp. I enjoyed breaking out my airbrush for the fishes. Also, just a friendly reminder that we have a new Challenge up over at the YNS Challenge Blog. We are working with Charms for this weeks challenge – So Charming. Hope you can come play along with us. Thank you so much for visiting with us today, and I hope everyone has a fun and relaxing weekend! It’s time for another YNS Challenge – YAY! Crystal is our wonderful hostess for YNS Challenge #41 and she has challenged us to use a charm on our card or project. I love charms and seem to stash them more than use them – oops! If you don’t have any charms here are a few ideas the DT came up with…you could make your own from sparkly cardstock or emboss a cut out with silver or gold embossing powder, you could dangle a pretty button or bead off your card or even make one from play clay – FUN! I was excited to look through my charm stash and decided to use a flower charm for my card today. 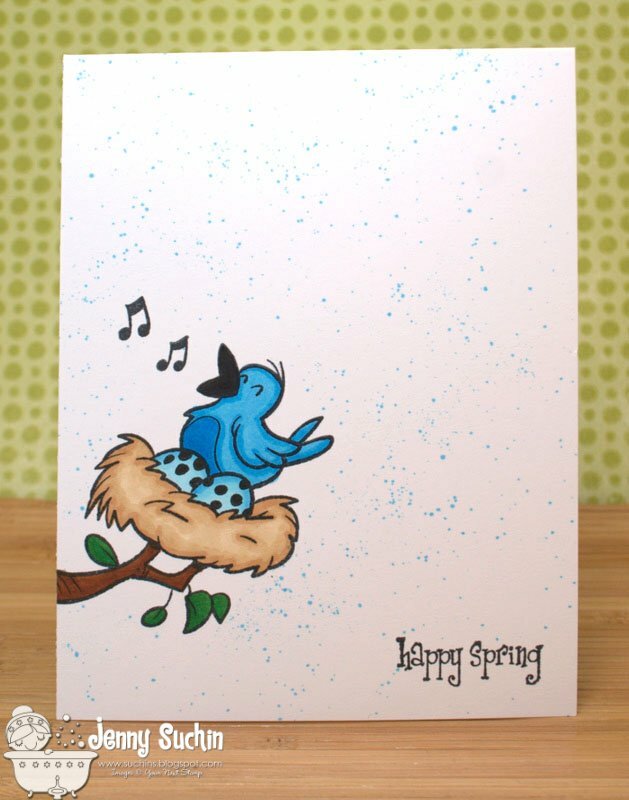 I paired it up with one of my favorite stamp sets by Heather Rolin – Happiness. I LOVE this set – the flowers make really fun DP and the sentiments are perfect for so many different cards and scrapbook pages – the possibilities are endless! Be sure to check out all the FABULOUS DT creations over at the YNS challenge blog and join in the fun for your chance to win some YNS Stamps! Hello and happy Monday! I hope you had a wonderful Easter! I have a card to share with you today using one of the newly released images called Home Tweet Home. Love it! I’ve always been drawn to birdhouses, and I really love the modern feel that this one has. The dp is some fab Echo Park Paper Co. For the Record and I used last week’s Mojo Monday #187 sketch for the layout. You still have a couple days to join us for the Texture It Challenge HERE! We’ll have a new challenge for you on Wednesday. Thank you so much for stopping by and have a wonderful day! Thank you for stopping by and commenting on the fabulous and fun April new release blog post! The DT did a fantastic job showcasing the new stamps! Thanks ladies! Congrats! Please contact me karen@yournextstamp.com to claim your prize. I’d also like to say Happy Easter! We are off to my parents house today for a fun filled day and then off to my in laws tomorrow for another great day – YAY! I hope your weekend is filled with family and friends too! This stamp was so much fun to color and I just had to pair it up with one of my new favorite paper collections – Echo Park Springtime. Hey everyone, Dana here and I’m soooo glad it’s Friday. It has been a super long week. I’m showing off the adorable newly released stamp set called Flutterbug Wishes. I know that you have seen some amazing creations this week by the DT members with this set and all the other ones. I super love this one because it just reminds of me of spring. So cute!! I hope you had a chance to pick up the new images out for April if not fly on over to the YNS Store and pick your stamp sets up today.